The diversity of United States with different cultural and ethnical groups has shaped the nation beliefs. The best way to feel the essence of the American culture is by experiencing its festivities some with a religious background, others are paying tribute to its ancestors. Starting with the 1st of January when the New Year’s bell rings, at that moment all the attention goes to New York Times Square to watch the iconic “ball drop”. 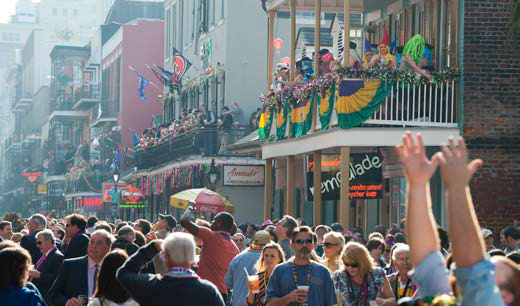 Crossing over to the sassy town of New Orleans and mingle in their lively street parades with the famous Mardi Gras (carnival celebrations). As soon as summer comes, the country stops to celebrate Independence Day on the 4th of July, marked by fireworks and barbecues. Finishing the autumn season, with Thanksgiving, the most American holiday, dates back to colonial times to celebrate the harvest season with a delicious meal.